Genetics and wildlife conservation specialists at Federation University Australia, in collaboration with the Victorian Department of Environment, Land, Water and Planning (DELWP), Gippsland Water and the South Gippsland and La Trobe Landcare Networks have secured a major grant to fund a significant conservation project. 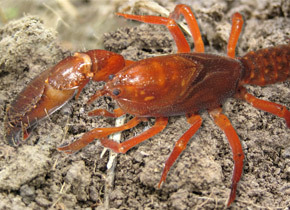 The $417,058 grant for the ‘Landscape-scale conservation of threatened invertebrates of the Western Strzeleckis’ will protect and restore habitat for 30 colonies of Giant Gippsland Earthworm and three threatened species of burrowing crayfish. “The project is an excellent example of collaboration between various Gippsland-based agencies and is part of the $86.3 million investment from the Victorian Government to implement Protecting Victoria’s Environment – Biodiversity 2037,” Associate Professor Wendy Wright said. “A total of 85 new projects worth $33.7 million focused on on-ground biodiversity action have recently been announced. The FedUni team comprises staff at the Gippsland and Berwick campuses: Dr Faye Wedrowicz, Dr Fiona Hogan, Associate Professor Wendy Wright and Associate Professor Jennifer Mosse.